The two pee sticks. Positive. Yes. Gulps. Capture the Everyday is about getting you to capture those everyday moments in your life! Each Thursday, Mel from Adventuroo will issue a simple challenge to capture something that’s a part of your daily life. It’s a quick, easy way to start capturing those little parts of life we sometimes take for granted. This little red dot that I am living on sits snugly near the equator so everyday is a Summer day for me. And what better to quench the summer heat than to indulge in a ice-cold drink? Nothing feels quite as awesome as a refreshing cold drink sliding down your throat on a scorching day. Which, in Singapore, is practically everyday. Gah. 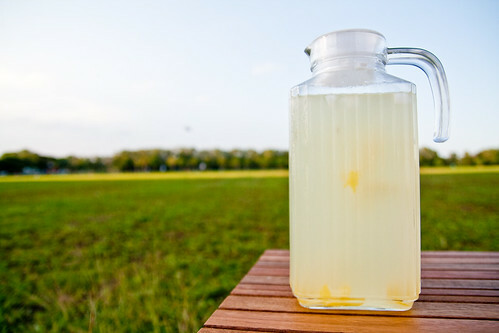 I had quite a bit of pain making this jug of lemonade for a picnic with the friends because I don’t have a juicer and was manually squeezing the juice out of those pesky lemons. I think there were seven of them altogether and my hands went sort of numb. Needless to say, I stopped making lemonade for a while. Okay, so it’s not quite a summer food but I daresay it counts. Heh.